The American Association of State Compensation Insurance Funds (AASCIF) has announced the winners of its 2017 Communications Awards at their annual meeting in Oklahoma City. 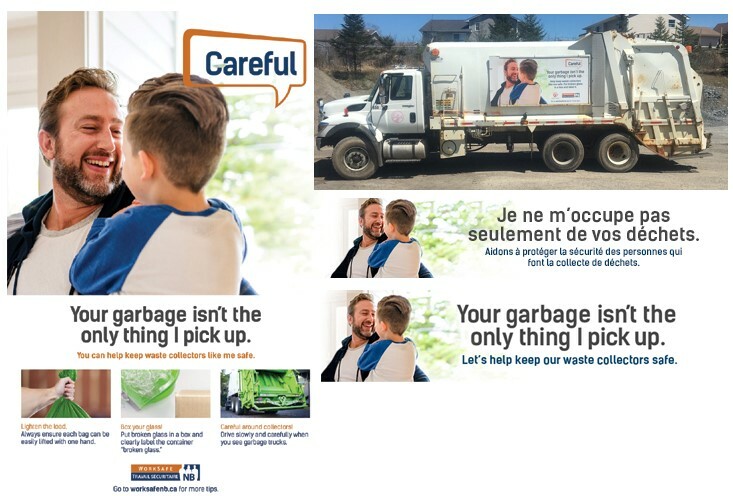 WorkSafeNB was selected as “Best in Show”, and won first place in the External Communications Campaign category for their Safe Waste Collection campaign. Their rate setting video placed second in the Audiovisual Productions category. This is the second consecutive year that a WorkSafeNB product has been awarded first place. WorkSafeNB is proud of their dedicated employees and agency partners who worked hard to develop and promote the campaign and video. Waste collectors are three times more likely to be hurt on the job than the average New Brunswick worker. Their exposure to traffic as well as heavy and unsafe waste bags and containers (containing glass or needles) makes them especially vulnerable. The Safe Waste Collection initiative had four key components: increased education; compliance activities; recommendations to require safety policies and procedure in the tendering process; and, public awareness and engagement. The audience for the public awareness campaign were homeowners. The campaign sought to seek the public’s help to ensure their garbage is safely prepared for pickup, and to slow down in areas where collectors are on roadways. As a result of higher than expected claim costs in 2016, WorkSafeNB raised its 2017 assessment rate by 33% for the first time since 2010. Knowing employers would have questions, WorkSafeNB wanted to be transparent and forthcoming about the reasons for the increase, and simplify the rate-setting process. With the exception of actuaries and accountants, most employers have a hard time understanding how assessment rates are determined. In the fall of 2016, WorkSafeNB developed a communication plan, which involved stakeholder meetings, a news release, a one-page mail insert with frequently asked questions on the rate increase, website resources and a two-minute animated video on how rates are set.